The 2016 summer of golf is here, and it is looking to be a cracker. With the long-anticipated World Cup of Golf played at Kingston Heath, the Australian Open at Royal Sydney, and the Australian PGA Championship at RACV Royal Pines, Aussie golf fans are in for a real treat. The World Cup of Golf will feature one of the best fields we’ve seen down under in quite a while. Just look through the field listed on page 21 this month, and you’ll surely agree that it is a star-studded combination of players that will doubtless result in some fantastic golf. As you know, golf as a sport has hit a global rough patch. One of the reasons is dwindling sponsorship money. Especially here in Australia, where there are a lot of sports (and in golf’s case, a lot of events within the sport itself) competing for a limited share of funds and sponsors. If potential sponsors see empty seats and sparse crowds, it reinforces a message that golf is struggling. 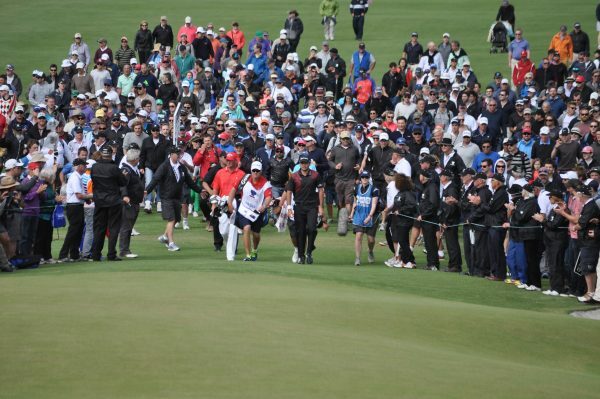 But by packing huge crowds into an event, we can make a statement to potential sponsors that golf is (as we all know) a vibrant, worthwhile investment, with plenty of ROI. Aussie golf needs big sponsorship dollars to survive (and thrive), and a large crowd can provide plenty of eyeballs seeing sponsors’ logos. A crowd is drawn to a crowd. There is a standard rule in many restaurants or pubs that you fill the seats near the front window/door early—knowing that passers-by will be drawn to a place that looks popular/buzzing (and conversely will avoid a place that looks empty/dead in the front window). Golf events are no different. We’ve all been to events where there is a buzz; a level of energy from the crowd that simply kicks things into another gear. The Ryder Cup is a great example: the players feed off the fans’ energy, which in turn leads to the fans feeding off the players’ boosted energy, and so on in. If we show some terrific fan support (and buzz) at these events, the top players will surely be keen to return in the future. And sponsors will also take more notice. And more fans will want to come to soak up the atmosphere. It’s win-win-win. We all know that Australians are among the most sports-mad fans on the planet, so it’s time to kick it up a notch (or ten). It will grow the game significantly, especially with juniors. At all three of these events, juniors 16 and under get in free with a paying adult. It’s the best-value weekend entertainment out there! And every time I go to these events, I see juniors getting inspired to play. Without fail, these future golfers will invariably grab dad’s umbrella, or a fallen tree branch, or whatever is at hand, and practice their swing beyond the ropes, dreaming of playing this great game. You cannot get this sort of inspiration anywhere else. With all that in mind, you can see why I believe it’s so important that we throw some major support to our major events. It’s in our hands to show the world just how supportive (and golf-obsessed) we all are, and how great our game truly is!